Welcome to another edition of Not My Child Monday! 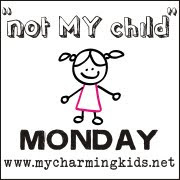 Check out MckMama's blog to read other Not My Child Monday posts, or to join in! School starts in just a little over 2 weeks for Dylan. Our new back to school schedule is going GREAT! For instance, the kids were not up until after 10 on Saturday night. Because they were up so late, and spent the entire day outdoors, they did not sleep in until after 11 AM on Sunday. I had great intentions when I put them to bed at 8 last night. Lexie fell asleep right away, but Dylan was not up until after 11, coming up with every excuse in the book as to why he couldn't sleep. Just after he fell asleep, Lexie did not wake up, because she heard me dumping out a bowl of M&M's and start yelling, "I want Em Em Em's!" When that failed to work, she did not shout out, "Mommy, I'm done!" Over and over and over again. We have a rule about not climbing or wrestling on our couch. So it wasn't Dylan who climbed on the couch, fell, and took down the floor lamp with him. My mom did not say, "Stop kicking my a&&!" while playing a game of cards with me. Miss Repeat did not turn to me, and say, "Mama, stop kicking Nina's a&&!" Dylan did not hit his head 4 times yesterday. He is not completely accident prone. Lexie did not scream in the middle of Target, "I hafta pee!" We did not race through the store to make it to the bathroom in time. Once she did her business, she did not exclaim, "Yay! I peed! I peed!" causing the entire restroom to erupt in laughter. Speaking of potty training, she did not insist she had to pee while we were driving. We did not pull over, sit her on the potty, only to have her laugh, and say, "I don't hafta pee. " I did not catch Dylan riding a turtle statue in my aunt's garden. Said turtle was not worth several hundred dollars. The kids have not been fighting nonstop for the past two days. They have not thrown punches or kicks at each other. Lexie is NOT potty trained. She has not been accident free for days! Awwwwwwwwwww, way to go LEXIE!!!! "I don't hafta pee. " That's hilarious! Nate tells me "I pooped" when he has to pee. It is so funny. It usually means I have between 30 and 60 seconds to get his pants down so he can go. I hate potty training! YOur kids are the best! I love the Target story, so something Asher would do!